Lifestyle Archives - Don Phin Esq. I’m a big fan of Shark Tank. There is so much to be learned from watching that show whether you are and investor, entrepreneur or employee. First here is some of what I’ve learned from watching Shark Tank. Don’t come with just an idea. People get ideas every day, but few ever execute on them. Don’t present until you’ve had an earned income and produce a profit. Is the opportunity scalable? How much efficiency is created by scaling? Is there an available market? What have you done to protect your idea-have you attempted a trademark or a patent? What deal you have for me? Have you thought it through? How do you arrive at the valuation of your company? Try to align yourself with an investor who is a natural fit. If you’re in real estate, IT or retail, who should you partner with? Last but not least, be entertaining but not a clown. 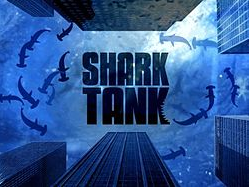 What about conducting a Shark Tank show at your company? Since you are in a R&D phase you may have to relax some of the rules around existing sales, etc. Create rules that make sense for your show. The judges can be the executives and presentations can be made on an individual or group basis. Remember none of us is smart as all of us, and this is a great way to engage your workforce to help you come up with new ideas. Most people reading this article go to a defined workplace every day. Even if you’re a sole entrepreneur like me and consult with clients, you still have your office space, whether it’s at work or home. Your environment always communicates to you. It is never not communicating. Just what is your environment communicating? How are you branding you to you? First there are the obligatory family pictures. My only suggestion is you keep them up to date. You don’t have a full head of hair and your wife is not 25 anymore. (I’m speaking of myself of course). Be in the now. Then there are all those pictures with the celebrities you’ve met in life and myriad of diplomas up on the wall to impress everyone else about how important you are. I guess if you’re selling to a very conservative clientele and you’ve got a picture of you and Ronald Reagan up on the wall, that’s probably a good thing. If you need it to remind you how important you are, it’s probably not a good thing. I like to put up my main goals on a whiteboard. I’ve learned that the smaller the whiteboard I use, the more focused I become. I love going into executive offices where there are these enormous whiteboards filled up with the same writing that’s been up there for six months. If it’s up there to help you show the big picture of your operations, then great. If it’s something that should’ve been done six months ago, then it’s not so great. Plants are a must have in your office. It helps bring your environment to life. It also supplies you with more oxygen. The more plants, the better. What about art? Art can agitate us, inspire us, or settle us down. What is the purpose of the art in your environment? I’ve gone into plenty of offices where the art up on the wall was meaningless and suggested by some interior designer. That’s not good art. Put up art that speaks to the work you do or otherwise inspires you. Then there are our books. In my litigation days, my bookshelf was crammed top to bottom, books piled on the side… you get the picture. Then my wife hired a feng shui consultant for me. The first thing she did was to go over to the bookshelf and ask me if I had touched each book in the last three years. Those I had not were tossed to the middle of the floor. You can imagine my panic! Once she had completed that exercise, less than a third of the books remained on the book shelf and all were neatly arranged. She told me that now my chi (energy) could flow. And boy, did it. I had great months after going through getting my office feng shui’d. It may just be coincidence but who knows? The desk. A person’s desk says a lot about them. What’s it made of, how neatly is it kept, is it functional, etc. Personally, I like using organic materials in my office wherever possible. So I have a bamboo desk and bookshelf. Then there is the chair we sit in every day. Or not. 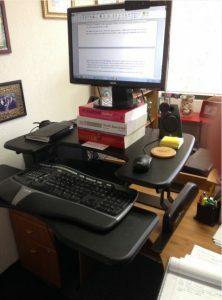 Last year, I experimented with a standup desk. Now it’s what I use 90% of the time. At first I had the $22 Silicon Valley Ikea model standup desk and then I progressed to a $350 Varidesk, which has been a great investment. I also got a $100 standing mat from Topo. Here’s a shot of the setup. Notice the ergonomic keyboard too. Last, breathe good air. I’ve invested in a $89 Honeywell air filter and if you’re working in a closed building like I do, then you should as well. Gurdjieff stated that “life is breath”. If that’s the case, then it’s worth investing in an air purifier. What have you done to make your space a great place to work? I’d love to see your comments below.